Meet Truckee: Lead Avalanche Dog with the Heavenly Ski Patrol! You might know him as the adorable back-sliding snow dog you've seen in that video your younger social media-loving sister shared with you. However, there is more to this dog than slushy sends down the mountain. Meet Truckee, the black lab who has saved lives at the Heavenly Ski Resort in Lake Tahoe for the past 7 years. 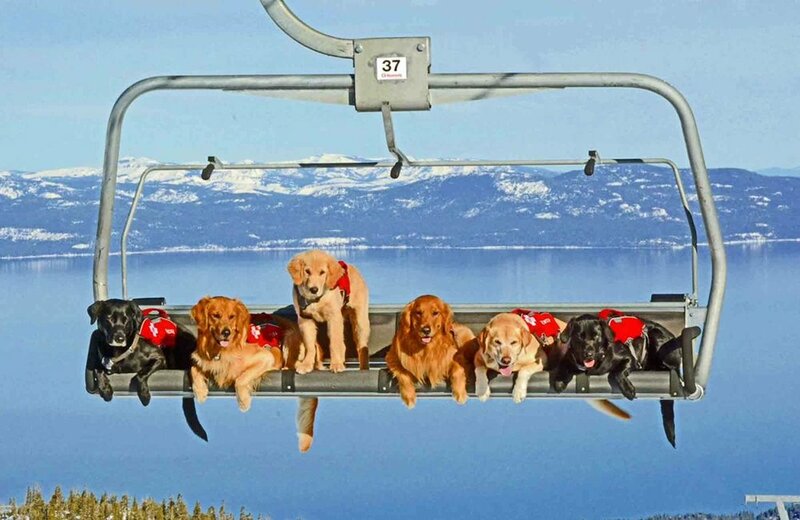 Truckee (left side black lab), with his 5 other co-workers. Truckee is one of the 6 avalanche dogs who roam the mountains of Heavenly amongst the ski patrollers. Each dog has a primary caretaker - their mom or dad - and a backup secondary caretaker. They start training as pups and continue training until they retire. When I say training, it's more like a game of fetch, until things get serious. These dogs and their caretakers start off with obedience training, you know your typical "good boy" behavior, and then transition into progressional training, which in turn leads to their job of search and rescue. Progression training consists of an article search, blind article search, and finally finding a buried human being. The first step of progressional training is an article search or the dog finding their favorite toy. The pup is first shown his toy and where it is hidden. They are then taken away from where their toy is hidden and told to fetch it. In the next step, blind article search, the dog is shown their favorite toy or an item but not shown where it is hidden, and are asked to find it. Once their caretakers feel confident with the dogs progress, it is time to move on to human beings. Just like article searches, they are first shown where the human is buried (usually a person they are familiar with), and then taken away and asked to find them. The last step is blind human search which is most like a real-life scenario. An unfamiliar human/scent is buried and the avalanche dog must find them. Truckee is currently Heavenly's oldest avalanche dog. When he first started his obedience training, a game of tug, not treats, became his reward. According to Chris Child, Truckee's primary caretaker, the game of tug makes Truckee an excellent avalanche dog. Essentially, when the time comes that Truckee is put to the test and finds an avalanche victim, he will not let go. At South Lake Brewing Company, we are excited to support these Avalanche Dogs and a local Humane Society, through our Pints for Paws fundraiser night on February 9th, 2018! Come to the SLBC tasting room starting at 6 PM on Friday, February 9th to meet Truckee and a few of his co-workers (the human and dog kind). Other pups are welcome on a leash. 10% of beer sales that night will be donated to the Avalanche Dogs of Heavenly. The Oven, wood-fired pizza, will also be on site that night. We are looking forward to a night of pups, pizza, and pints!